I've always loved Denim skirts but for some reason I sometimes find it difficult to style. They can either be styled up and casual and I have a hard time deciding which way I want to style it. I definitely find it harder to dress it up, especially distressed styled denim skirts so I usually try to keep it a little more casual! For the most part, I usually wear a white top with my denim skirts. I love lightening up my skirts rather than darker it. I feel like it makes my outfit more lively when I wear a white top rather than a black one. And while for the most part, I LOVE wearing heels, I decided to wear my Ked sneakers this time around for comfort while running errands and I wanted to play it down a bit (and give my feet a rest as I usually wear heels). I, of course, chose an off the shoulder top because I'm obsessed and I got the one I was wearing on sale at Zara! The ruffled top is just too cute! I love denim skirts, I think I need to add a few more styles into my wardrobe! 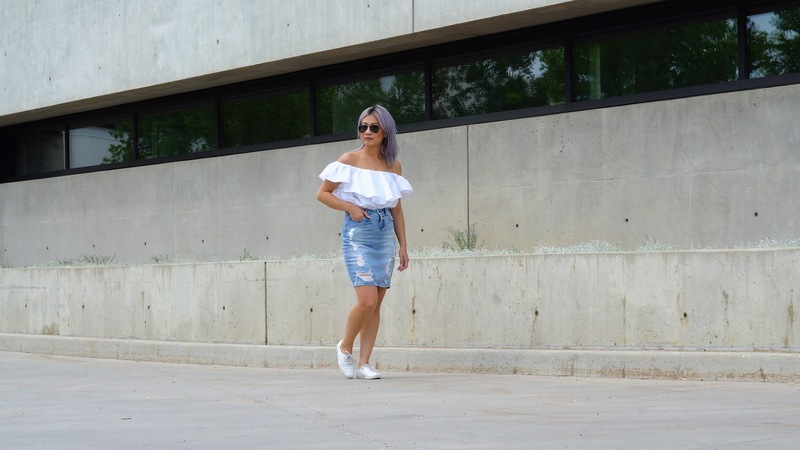 You really rock that blue denim skirt, and I LOVE the off-the-shoulder ruffled crop-top you styled it with for this OOTD! You are looking so gorgeous!!!! 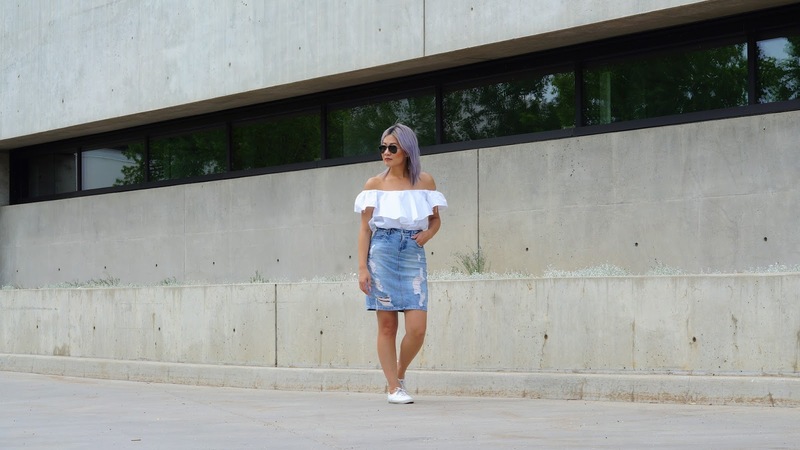 I love how you styled this jean skirt! So effortless! Amazing denim skirt and super cute top! I sooo love the skirt together with that amazing top!